Here is another interview with Children's Wheel of the Year illustrator, Julie Freel. This time I want to let you in on her other life, which is as an expert on the emotional development of children. Her input has also been very helpful on the writing side of the books, ensuring that the stories and dialogue are helpful to children, even as they entertain. Welcome back to the blog, Julie. How is the illustrating for this project going? It's getting easier and more fun. You work with children for your day job, right? I am a Licensed Clinical Social Worker. I've provided services to children and families for 25 years. We always say plants need soil, water and sunlight to grow. Can you sum up what children need to grow and flourish? Kids need safety and security to survive. To thrive, children need a reliable someone paying attention, providing care and nurture. To flourish, kids need motivational opportunities such as new experiences and ideas as well as opportunities to develop skills and talents. What role does self-confidence play? At a certain age, kids need challenges. Shanna and the Goddess is a story about how challenges help to build confidence. Giving children an opportunity to meet challenges helps them develop a healthy sense of self, challenges that are genuinely meaningful within the context of their lives. The opportunity to be needed and the feeling that your contribution is valuable can develop a sense of self, if it's not above your developmental level. A five-year-old without an available parent who has to figure out how to get food for his three-year-old sister isn't being provided with a helpful challenge because it’s beyond their developmental level, causing later emotional problems. But if it is a challenge that causes you to stretch and prove your abilities, where you get the opportunity to test your real limits, it builds confidence. Self-confidence is what underlies motivation and the ability and willingness to try things, make mistakes, learn and grow. Many people have abilities and exceptional talents but are unable to find the motivation to express them. Some people say it's laziness but I would say it has more to do with lack of self-confidence. Self-confidence makes life more fun. What is self-regulation and why is it important to children's development? Self-regulation is the ability to manage our emotions and behavior within the context of the expectations in our situation. It includes emotional regulation; or the ability to manage emotions, to calm oneself when upset and to adjust to changes. These skills allow us to direct our behavior towards goals despite the unpredictability of the world and flux of our own feelings. Without adequate emotional regulation, children are less capable of succeeding socially and academically. Our abilities to self regulate are largely developed before the age of three, including prenatal development. With a safe environment and responsive caregivers, children develop the capacity to calm themselves under stress. Without a safe environment, our brains develop patterns of hormonal responses that last a lifetime and take a great deal of effort to manage, impacting our abilities to be fully present to our life experiences. Do you think self-regulation is particularly important because of the emphasis of today's society on academic success in a sedentary structure? Self regulation is important in any society. There is a difference between being able to regulate ones’ emotions and the ability to sustain attention. A societal emphasis on academic success within a sedentary structure is not conducive to sustained attention for many children. But being able to regulate emotions is essential to social connectedness and success with any endeavor that requires sustained effort. Our abilities to self regulate directly relate essential relationship skills: to our ability to be present to our own emotional experience and that of another person. What are some ways to help kids who struggle with self-regulation in school? It depends on the need. It is helpful to have a calm-down place where kids can self regulate. Children benefit from learning mindfulness skills such as body awareness and yoga. Emotional intelligence skills can be taught; for example, learning to identify and name your feelings and expressing them to others calmly. These skills can be integrated into social relationship skill building. Children need to be taught how to express themselves in ways that are sensitive to others and help in problem solving their daily challenges. academically--with each other. Normalize the need for calming down and the need to help each other calm down. Teach children how to be there for each other when someone is having a hard time. In addition, doing projects--just getting out and doing things--is a huge predictor of future success for children. That's one reason why too much time sitting in front of video games is such a problem for children. They aren't having opportunities for building the many skills that are necessary steps toward self regulation, confidence and competence. 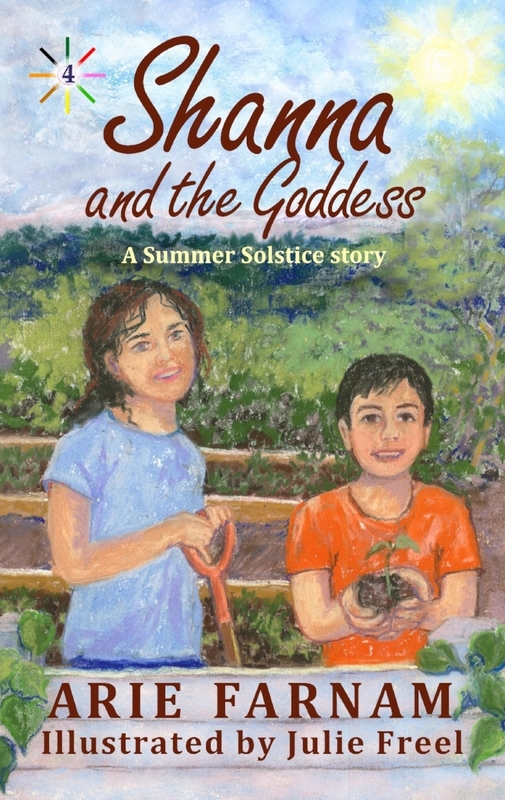 The book Shanna and the Goddess has a lot about children gardening. Do kids gain more from gardening than just technical skills like other chores? Gardening helps children connect to nature and the earth, offering a source of calm and connectedness to the environment as well as to one’s family. Nature is one of the greatest sources of internal peace and satisfaction. With so many demands today--academics, sports, foreign languages, creative enrichment opportunities for kids and then those chores--do you have any advice for parents hoping to include some sort of spirituality in their children's lives? If it is a part of your life, spirituality will naturally be a part of your children&#39;s lives. If you want spiritually based celebrations, you have to make that choice and put it into practice for yourself and your family. Living your spirituality has to be integrated into your daily life as well as your celebrations, in order to be meaningful. Thank you so much for your perspective on this. And happy painting! The turning point of the new moon is just hours away. And that makes this a perfect moment to announce a new beginning. The fourth book in the Children's Wheel of the Year has finally arrived. This is, of course, the long-awaited Summer Solstice story, the previous three having focused on Imbolc, the Spring Equinox and Beltane. The Summer Solstice is one of the nature-based holidays that gets the least attention and there are remarkably few books out there for kids on the subject. Of those that are available, most either teach about the traditions of various cultures in the past, such as The Longest Day, or mention the Summer Solstice with a host of other holidays such as Rupert's Tales or An Ordinary Girl - A Magical Child. For many people who don't follow a major religion in our modern society, it is hard to feel connected to holidays that have lost much of their tradition and essential magic to commercialism. One alternative many people are now embracing is the celebration of naturally occurring transitions, such as the solstices and equinoxes. Some spiritual paths also hold these as holy days, but even for atheists and agnostics, these moments can fulfill the human need for bright gems of interest amid the routine of daily life. The summer solstice has been celebrated in cultures all over the world--from the equator to the poles--for thousands of years. It is the time of flourishing life in each hemisphere, a moment of fullness and a turning point in which seasons begin to swing back. The summer solstice is the top of the pendulum, the height of a swing. And like a child's swing it gives us all that giddy feeling children get at the moment of weightlessness as the chains of the swing stop propelling them forward and hesitate before pulling them back. That is also the moment where the swing set is no longer visible and you feel most as if you were flying. The summer solstice is the cosmic equivalent of that giddy instant. Our faces are in the sun and for a moment it feels like everything is possible and we are far more capable than we knew. The title of the fourth book in the Children's Wheel of the Year series is Shanna and the Goddess, and it is a story about the accelerated growth, confidence and courage that can result when we are challenged by adversity and we are capable and ready to meet that challenge. In this book, eleven-year-old Shanna and her eight-year-old brother Rye take on grown-up responsibilities when their mother breaks her ankle at the beginning of the summer. Shanna is determined to save the newly planted garden from drought and neglect. Rye takes on cooking with some interesting and tasty results. Both gain confidence and skills, but their courage is tested when a massive hail storm threatens to flatten the garden. Instead of being primarily a teaching tool, like many other books about natural holidays, the Children's Wheel of the Year series offers adventure stories linked to the themes of earth-centered holidays that are fun to read and listen to. The Shanna books are not focused on teaching kids how the holidays were or are supposed to be celebrated. There are examples of traditions in the books because the family in the story celebrates the holidays. But the focus is on a kid-friendly story. Shanna and the Goddess is available in paperback and kindle formats here. One day in seventh grade is etched into my memory. I was sitting in the second row in a dimly lit science classroom, bored as usual. Our teacher was uninspiring. He was droning on again, something about a military program to train dolphins to attach bombs to the bottom of enemy ships. I wasn't sure what the science point of the lecture was. Animal behavior maybe? The chemistry of explosions? You never knew with this guy. But then this sentence got my attention: "So then these morons from Greenpeace came along and started blockading, so that they had to stop the program and put the lives of our troops at risk." I raised my hand. Most of the class was half asleep anyway. I wasn't even sure what I was going to say until he called on me. I tried to find words for the wrongness I felt in the lecture. I think I said something along the lines of, "So you think dolphins should have to do the humans' dirty work?" There were a few snickers around the class. The teacher leveled his gaze at me and paced a few steps closer. At least to me as a seventh grader, his voice was low and intimidating. "And you think a dolphin's life is more important than a human life?" More snickers and a few derogatory comments were flung my way by some of my classmates. I wasn't one of the popular kids who would get support for mouthing off to a teacher. And apparently mine wasn't a popular sentiment. I had all kinds of arguments, all lined up. But I also knew this wasn't one of those times where reasoned argument would work. You don't argue with teachers in front of the whole class, not if you want to avoid trouble. How many times had I been told that? I knew that if I got one more sentence in I'd be lucky. And for once I had it. "If they are so concerned about human life, what are they doing blowing up ships in the first place?" The snickers stopped. Everyone was watching the teacher and waiting for his reaction. He stumbled a bit over his words, told me I was out of line and went on a rant about "patriotism." But I didn't care anymore. I knew when to quit. It was lonely being a wannabe activist in 1988 in rural Eastern Oregon. Today it may still not be the mainstream, especially environmental activism. but at least there are places to turn. If I was thirteen now, I could get on the internet and find like-minded others. In the last few weeks, I could see and join the amazing youth movement for gun regulations. We scarcely had books about nature and PBS documentaries. If you were interested in activism for social or environmental causes, it was a long, lonely and mostly silent road. Today there is more media and more connection across distance, especially for teenagers. 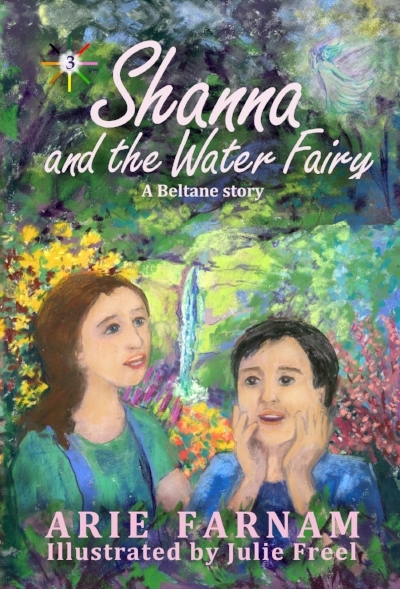 For younger kids, there are books like Shanna and the Water Fairy. I wrote this story with kids and parents on the activist road in mind. It's a gateway for kids ages six to twelve, for those who might feel like lonely voices against wrongness in hopes that they may add their voices to the rising tide of young activists for a better future. 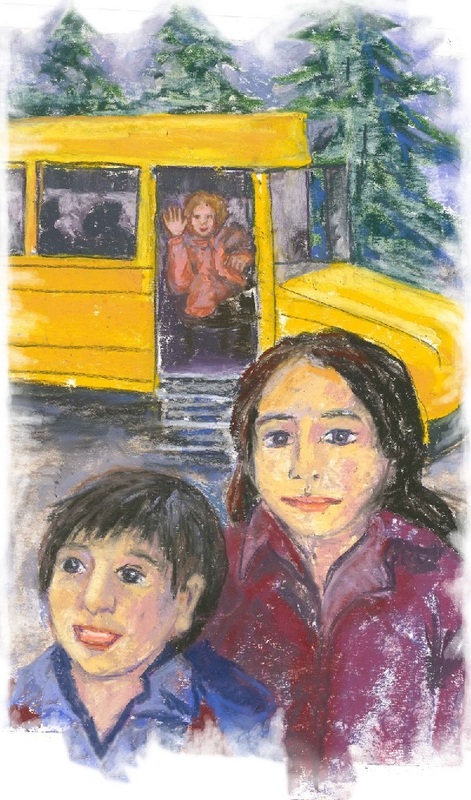 This is the third book illustrated with emotive oil pastels by Julie Freel. It tells the story of a sister and brother, Shanna and Rye, who discover a hidden spring on dry waste land behind their school. The spring is a magical pocket of vibrant life in a drought-stricken land, a sanctuary for wildflowers, butterflies and a being they call a fairy. 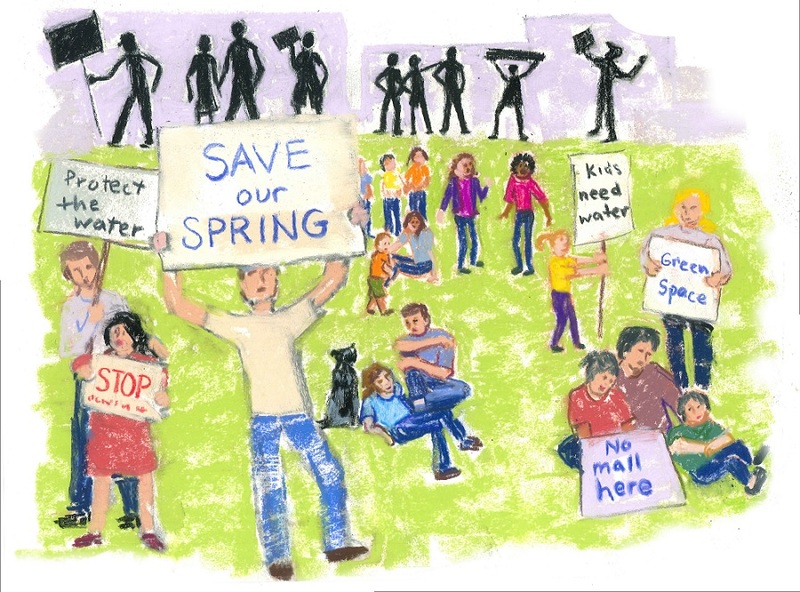 When the children discover that the spring is slated to be bulldozed to make way for another shopping mall, they look for ways to call attention to what would be lost and inspire local activism of their own. Shanna and the Water Fairy is the kind of book I longed for as a kid. It is a story that reaches out to every kid who has wanted to be heard and taken seriously for concerns many adults think kids aren't bothered with. You aren't alone and your voice does matter. This is the time of the rise of young activists, millions strong. When I was a kid, I knew I wanted to live close to the land, to live out of the city, grow a garden and even raise chickens. I wasn't just being romantic. That is how I grew up and I knew about the work involved. Still my reasons at first were not the same as the reasons of grown-ups. Living close to the land is a bit healthier, but it's also harder on the body and often plenty heavy on the mind. My own reasons had more to do with where I felt most alive. When we experience something with all of our senses, we feel much more alive. If you live close to the land, you have to be out in all weather--feeding animals, digging in the earth, planting, harvesting and fixing things. Often it doesn't seem pleasant but you feel, smell, see and hear everything. As long as this is part of your survival, rather than just a good-for-you walk in the midst of an otherwise dull day, you won't be bored. Kids often understand this even if they live in a very artificial environment. When my young son marvels at the return of snow and only vaguely remembers when it was last here nine months ago, he tastes it, smells it, stands listening and then runs around wildly flailing in it. "Mama, will the snow always be here now?" he asks. His sister, two years older and oh so much wiser, sneers, "No, baby, it will only stay until the trees want to wake up." While the squabble over who is a baby goes on in the doorway, the cold wind swirls into the house and a crow (or possibly a raven, my eyes aren't good enough to tell the difference) quarks from the young oak in front of the house. Many grownups today barely notice the first snow fall, let alone a single bird in a tree. But I notice. This bird with its solid black feathers is interesting and important, just like the traffic signs on the road. It is part of paying attention and being fully alive. Fortunately, it doesn't matter much that I can't tell if it is a crow or a raven. They are both considered important and even magical birds by people all over the world. Europeans, Native Americans, the ancient Chinese and the ancient Egyptians all saw the crow and raven as symbols of real-world magic, the mysteries of the unknown, and possibly death, as well as transformation, healing, wisdom, protection and prophecy. While some cultures connect this bird to the sun and others to the dark of a moonless night, there is no human culture where they are native that does not see them as powerful, mysterious and noteworthy. Modern pop culture suggests that all symbols of the crow and raven must be sinister. But that wasn't traditionally the case. Our great grandparents might have told us that the appearance of these black birds is a reminder to pay attention, to follow your intuition, to use your personal integrity, to reserve judgement against people, to question your assumptions, to think independently or stand out from the crowd. Some people believe that crows and ravens can bring messages from another world, perhaps from ancestors. Others believe the bird simply shows that something is going to change or that it asks us to be faithful despite changes. 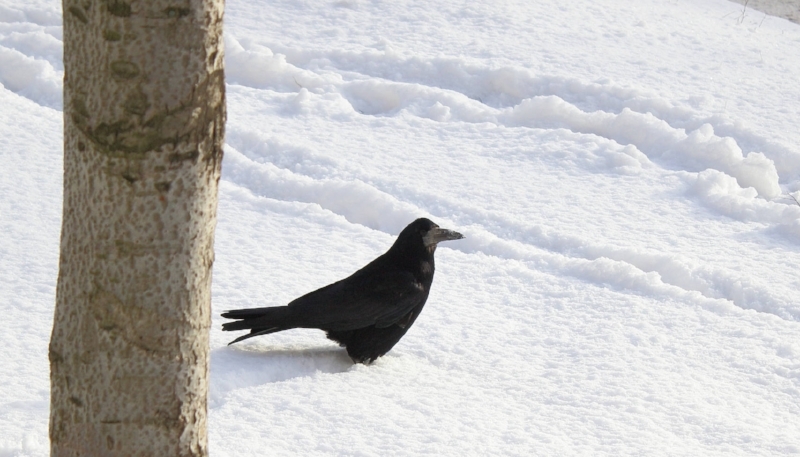 Crows and ravens can eat almost anything and adapt to very different environments. Crows always keep a mate but often live in groups. Ravens are faithful to one mate for life and often live in pairs. This is one reason why these birds symbolize faithfulness to many people. Both types of bird are very intelligent compared to other species. Their cawing, which sounds pretty raucous to us, is actually a sophisticated language. Different kinds of cawing mean different things. Crows will often build false nests to fool predators and to protect their young. When they are in a group they will let one member check out any new object while the others watch and learn. When they eat as a group, they post sentries to warn of danger. They will even warn other animals, and especially deer, with a lot of noise when hunters are around. These are all reasons why these birds came to be symbols of wisdom and caution. They are not dangerous themselves. Instead, if we are careful and pay attention to them, we can learn to protect ourselves both physically and intuitively. What do they teach us? Crows and ravens have shown humans how to think things through and question our assumptions. Over time, many people came to see just the appearance of one of these birds as a reminder to look beyond first appearances, to avoid quick assumptions, to measure every thing based on an objective standard, to explore the unknown and to cross physical and mental borders. In a media-saturated world it is often difficult to tell the difference between your prejudices and true intuition. These birds are a good symbol to keep in mind. Many cultures believe that seeing a crow or raven means you should spend some time in introspection, make sure things are as they seem or try to remember what you may have forgotten or left behind in your hurry. Different cultures have very specific omens associated with crows and ravens, often depending on which direction the bird is from you and what time of day it is. It may be that these symbols work only in the place they come from. It is more likely that these omens or "rules" were devised to try to explain the intuitive messages of the birds in a logical way. The problem with this is that intuition defies logic. It might then be more effective to observe the specific case without much reference to rules about whether the bird is on your right or on your left or if it is morning or afternoon when you saw it. It is the general reminder of caution and the need for intuition that is universally understood about crows and ravens. When so many diverse cultures with long and learned histories arrive at the same conclusion, it is worth paying attention. A couple of years ago, I wrote a story for kids and adults that gives a real example of how this can work. The story is Shanna and the Raven. It's about a girl named Shanna and her brother Rye, who see a raven after they meet a neighbor who makes them feel strange. The story is a tiny bit scary but it shows how intuition can be a powerful protective tool for both kids and grown-ups. Shanna and the Raven is also a story about this time of year. Shanna and Rye celebrate a very old holiday called Imbolc, which is about intuition, inspiration and prophecy, just like the raven and crow. This holiday comes on February 2 and you can try out their recipe for strawberry dumplings, which is really delicious, or make a doll of the Irish goddess Brigid using their instructions. You can start reading the story and see many of the beautiful illustrations by Julie Free at the bottom of this page. Readers have been waiting a whole year for the next installment of Shanna's story. Words fall quick but the pictures to make a story come fully alive take more time. Still the wait has been worth it. The third Shanna book has the most beautiful illustrations yet and a story that will keep kids breathless for each succeeding chapter--judging from my experience reading it out loud. This time eleven-year-old Shanna discovers a hidden spring on the city waste land behind her new school. When she learns that the spring and the pocket paradise of trees and flowers around it is to be bulldozed to make way for a new shopping mall, Shanna is horrified. Not only is the spring a beautiful place and the water is sorely needed to help irrigate the soccer field and school playground, she's also pretty sure there is something--or someone--magical about the spring. After Shanna writes a letter of protest to the local newspaper, she and her eight-year-old brother Rye get a glimpse of the grown-up world of city politics. They learn about activism and how committed individuals can make a difference in a community. In the midst of it, they share the celebration of Beltane with their friends from many cultures and help to spread the love and passion for justice that infuses this special day. While this is the third book in the Children's Wheel of the Year series and readers of the other books will recognize the main characters, the book can easily be read on its own. It is a real-world adventure story for kids who care about their community, their friends and the earth. Now with no further ado, here is an excerpt from the beginning of Shanna and the Water Fairy . If you would like to see how this story appears on a Kindle, you can click on the orange button to go directly to an Amazon Kindle preview of the book. No app or other download required. Go to a Kindle instant preview of this book. No app or other download required. Shanna grasped the rough rock and pulled with all of her strength. She gulped in a great lung-full of the rich spring air and heaved herself over the last boulder just ahead of Rohan, Ella and Rebecca. “Queen of the mountain!” she chortled as she spun in a circle and waved her arms in the warm, free air. Her friends pulled themselves up and collapsed giggling on the rock beside her. “You’re too fast!” Ella puffed, as she sucked on a scraped finger. “I’ll beat you next time,” Rohan laughed as he pretended to tackle Shanna’s foot. “Well, did you find any new rocks while you were scaling the mountain?” Mrs. Baker’s voice sounded like she was chuckling now. Another group of kids came running out of the trees to show Mrs. Baker their new rocks. They were led by a girl with light brown hair. She was Brandy, the most popular girl in the fifth grade. And she didn’t like Shanna. If she was entirely honest with herself, Shanna had to admit that she didn’t like Brandy either. But looking down from way up on the rocks, Brandy looked small and Shanna thought about how her new school wasn’t as bad as she’d first feared. Mrs. Baker, her class teacher, was a lot of fun. She had gray hair, but she still loved to go on field trips, and she found a way to do a lot of lessons outside—even math. This warm spring day they were collecting rocks for science. It was also for math though, because Mrs. Baker said they would be practicing percentages and graphs once they gathered all of the different kinds of rocks they could find on the waste land behind the school. The waste land was a long, low hill that ran up from the back of the soccer field through brush and rocks and a few scraggly trees to the new River View Condos. It wasn’t really a park and there was litter here and there among the boulders and water-starved trees, but Mrs. Baker said they had to learn as much as they could from it before it got bulldozed. Ella and Rebecca started looking for more rocks, walking up the gradual hill behind the Queen of the Mountain boulders. Shanna followed them at first, but then she saw dark green rocks down in a little gully under some particularly nice trees, so she slipped and slid her way down. As she got close she heard a splashing sound like water hitting a rock. Was someone pouring out their water bottle? What else would make that sound out here? Shanna looked in among the trees. They didn’t look very high down in the gully, but they were actually bigger and less scraggly than most of the other trees on the wasted land. Curious, Shanna stepped closer. In the little hollow under the trees the air smelled wetter. And the grass beneath her feet was brilliant green. Shanna saw something sparkle and flutter in among the trees. Maybe a butterfly. She climbed over some big rocks and slipped in between the trunks of the trees. And there behind the trees were more flowers than she had ever seen outside a flower shop. Red, purple, yellow, blue, orange… They hung down the rocks and covered the ground under the trees. Shanna looked around for the butterfly and there were at least ten of them, flitting in and out of the sunlight and shade. She was about to call out for her friends to come and see the beautiful scene, but something stopped her. One of the butterflies was different. It seemed to glow against the shadows under the trees and Shanna couldn’t see it right. It didn’t even look like a butterfly exactly, but it wouldn’t hold still so she couldn’t get a good look at it. Instead it zipped back and forth as if showing Shanna the way forward. It dipped first at Shanna and then back further into the trees. Shanna walked carefully now, trying not to step on all the beautiful flowers. The air in the little grove of trees was sweet with the smell of them—almost overwhelming, so it made Shanna dizzy. And maybe she was just dizzy when she looked up from her feet again and stared. There in front of her was an even more amazing image. Flowers with delicate dew-speckled petals hung down all over a wall of boulders. And the rocks weren’t really dark green like Shanna had thought. Instead they were covered with thick, wet moss. And out of a crack there came a sparkling trickle of crystal clear water. It leaped and splashed down the rocks below and filled a little pool, before trickling under the roots of a big tree and disappearing back into the ground. It wasn’t a stream exactly, because it just went back into the ground. But that wasn’t even why Shanna stared. Right in the middle above the sparkling pool was her butterfly. But Shanna was sure for a wonderful, dizzy second that it wasn’t just a butterfly. It had the shape of a person with wings and it shone with a turquoise light. Its wings were violet purple like the flowers and its hair was a deep blue green. Shanna couldn’t see it much better than that. Then it winked a deep greenish-brown eye at her and dove straight down into the water. In a flash and a sparkle of drops, it was gone. “Ella! Rebecca! Rohan! Come quick!” Shanna cried over her shoulder, too startled and amazed to rethink her shout. She dropped to her knees on the mossy rock by the pool of water and looked around as carefully as she could. Where had it gone? Had she seen what she thought she’d seen? A butterfly? Or… could it really be… a fairy? A real fairy? The other kids came panting into the grove of trees with thudding footsteps muffled by the grass, and Shanna didn’t see it anymore whatever it was. She thought then that she shouldn’t have yelled, but it was too exciting. “Wow! This is a really cool place,” Rohan said, looking around at the trees, the climbing and hanging flowers, and the little pool. “Good find, Shanna.” He grinned and ran a hand over one of the tree trunks. “It’s like it called to me,” Shanna said, still caught in the feeling of wonder. Get the rest of the book Shanna and the Water Fairy in paperback or as an ebook here. "If you have a choice of schools, ask what they do about bullying and if they say they don't have a bullying problem at their school, choose a different school," a teacher with twenty years experience once told me. "All schools have bullying problems. The ones that acknowledge the issue and have a policy for dealing with them have fewer problems." That is some of the best advice I've ever heard on the subject of bullying. And there is a lot advice out there, but much of it is ineffective precisely because it is focused on making things look peaceful and happy on the surface. As a girl, I was once the new girl at school. In class, I was treated well, if coolly. The school was a good school with high standards. But there was no policy or way of dealing with bullying. I went to the bathroom during a break and three other girls came in after me. They wetted down hunks of toilet paper and threw them over my stall door, jeering at me and laughing as they splattered me with the sodden paper. No adult ever saw these things and I was far from the only one to face them alone. I knew from a lot of experience that if I told teachers about the incident, it would be dismissed with a bit of sympathy or the teacher would freak out and demand to know who had done it in front of the class, which would result in far more ostracism. So, I never said anything about that incident. The cumulative effect of bullying can be quite severe, impacting a child's ability to learn and causing psychological and relationship problems that last a lifetime. If a child faces only a little teasing or bullying and it isn't addressed, they will often feel that it is "just the way life is" and thus they will become a perpetrator at other times. Every child in our schools has experienced either bullying or being a bystander, feeling helpless while another child is bullied. And many have been bullies and may feel defensive shame that actually contributes to perpetuating further bullying. The problems seem intractable, particularly considering how much violence and injustice children observe in the adult world. However, anti-bullying programs have shown over many years of trial that there are methods that schools can use to mitigate bullying and vastly improve outcomes. The methods involve mediation and bringing students, teachers and parents together to discuss divisive issues. But you may ask what you can do if your school isn't yet open to such holistic anti-bullying programs. Even where such programs exist, children need to build the confidence to speak up about harassment and have a measure of trust in the program. Where formal programs don't exist, there are still many skills that an individual child and her parents can employ to improve a situation. The healing purpose of the new book in the Children's Wheel of the Year series Shanna and the Pentacle is to highlight a real, contemporary and truly problematic bullying situation and offer a functional model for dealing with it. Unlike many anti-bullying books the end result is not a school with no bullying problem and a bunch of kids drawing rainbows. It is a realistic end, in which Shanna, who faced bullies, comes to understand the situation better and learns to stand up for herself. She gains friends among children who are open to differences. Because problems among children are often rooted in the attitudes of adults, this is also addressed and children can see that adults make mistakes and that these mistakes can be addressed through a respectful process. This book and others in the series can be used to give children confidence in a solution as well as to bring comfort in the knowledge that they are not alone. Every child is different from the norm in some way and many have experienced the pressure to shave off any of our protruding corners--to hide those parts of us that are not perfectly "normal." Healing stories give both children and adults the understanding of our differences as gifts and the knowledge of that many others have been through the same difficulties. Shanna and the Pentacle has just been released in ebook format and will be available in paperback next week. Find out more here. I was returning to the apartment of friends where I was staying late in the evening. I was a teenager alone in a city far from home. And one of those things that parents fear most happened. A man came down the sidewalk toward me and stopped under a streetlight. The street was nearly deserted, only the occasional car going by and no other pedestrians. The man greeted me in a friendly and kind way, but I felt instantly that something was not right. That illusive term we can’t quite explain. Some believe it's merely the quick, subconscious analysis of factors barely perceived by the senses. Perfectly logical and scientific. Others believe something more mysterious or spiritual is at work. Either way it's a faculty that we know we have. Myth has it that women use intuition more easily and more readily. But the truth is that men can use it as well. But in either gender it helps if one has some practice and confidence in one’s own intuitive abilities. That night when I was out alone on a dark street in a faraway city, I was afraid but I had been taught to use my intuition and I had been given a few self-defense skills by a handful of teen workshops. And so, with the feeling of danger buzzing in my nerves, I played cool for a few moments. I pretended I had no foreboding sense about the stranger and chatted lightly to him as we walked toward the dark apartment building. And I quietly gripped the key to the door in my pocket. As I turned toward the building and said goodbye to the man, his hand came out and settled firmly around my upper arm. My feeling of danger had been correct. Now, out of the light and away from even the sporadic traffic of the street, he would make his move. His hand lifted from my arm in a second of uncertainty as he doubted whether or not someone could be hidden in the shadows. And in that second, I bolted for the safety of the correct doorway, racing inside and up the stairs to a door with locks and deadbolts. Twenty years later, I am a mother myself with two growing children. And like all parents I want to arm my children with the skills to protect themselves in an unpredictable world. There are some who trust in weaponry, whether it be guns or pepper spray. But statistics don’t back the theory up. Such physical weapons are more likely to be seized and used against the defender than employed against an attacker. Others favor teaching self-defense and martial arts techniques at a young age. And these techniques are more useful. I carried pepper spray for years and never had it handy in any of the dangerous situations I encountered. However, I did use techniques like the ruse about friends waiting a doorway that I was taught in self-defense classes in this situation and another similar incident. So, I will teach my children these skills and see to it that they have more training in self defense. But I also know there is another faculty that was even more crucial to my safety at the time. I was prepared to escape and cautious enough not to give away the fact that I was alone, because my intuition was strong and well practiced. That I believe made all the difference in my two encounters with personal danger as a teenager and intuition saved me from great potential harm. That’s why I have given a great deal of thought to how to help children develop intuition. I know that it can be developed. It's enhanced by both practice and confidence. I trusted my internal sense as a young girl because I had been told by wise adults that I could and should tap into that inner knowledge. It was important both to my inner development and to my practical safety. As a writer, one of my tools is now storytelling and I’ve seen the power of stories to impart deeper understanding and inner confidence. 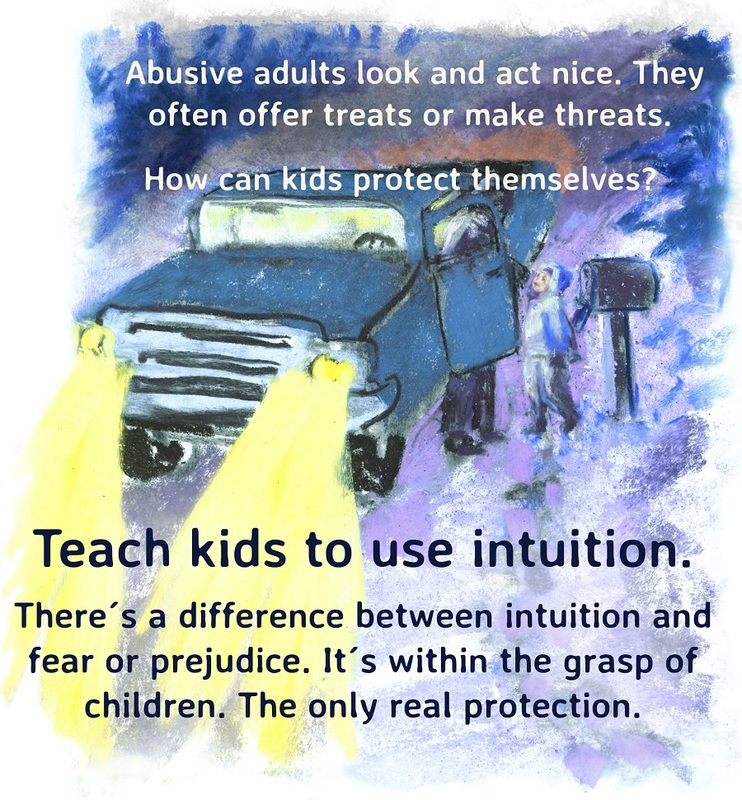 As a result, I became interested in the stories available for children on the subject of intuition and self-protection. But I was surprised at some major gaps in the literature for kids in this area. There are children's books that explain about "okay touching" and "not okay touching." There are even storybooks to help the youngest victims of abuse cope after the fact. But there is precious little out there to help children successfully avoid abuse or an attack in the first place. Partly this is because adults write the materials for children and it pains us to be too upfront because that might frighten children or lead to paranoia. And it's partly because evading harm isn't simple at any age and intuition is a slippery concept to impart. Beyond the issue of the topic, many of the stories in this area are not very much fun for children. They are too often pedantic and unlikely to be chosen by children. Instead these are books chosen by adults to forcefully teach a child. But anyone who has watched how children absorb information will know that it is very difficult to force children to learn concepts that are preached directly. It's much easier for children to absorb concepts and lessons that are part of a suspenseful, gripping story that is fun to read. From this need was born the first book in the Children’s Wheel of the Year stories. There is a tradition in the modern earth=based spirituality movement that claims February 2 as a holiday devoted to intuition and protection. It's an ancient Celtic festival called Imbolc. The themes are inspiration, intuition, protection, healing and the hope of new beginnings. These themes are embodied in the story of Shanna and the Raven, a book I wrote for children ages six to twelve, in hopes of answering the need for stories that help children develop intuition and train their inner listening skills. The story begins when ten-year-old Shanna and her seven-year-old brother Rye meet a new neighbor on their way home from school. The neighbor is nice enough but he asks their names without giving his own. And more than that Shanna just doesn’t have a good feeling about the situation. Then the children encounter a raven that seems to warn them of danger and darker fears haunt their steps. As the story progresses Shanna learns the meaning of intuition and the raven, which she initially thought might be a bad omen, helps her to understand her inner sense. When true danger threatens her brother, Shanna’s intuition leads her to come to his aid in time. The story teaches both how to tap into intuition and the confidence to trust one's own sense. Shanna and the Raven is the first book in the Children's Wheel of the Year series. It will be published on January 8. Within a few days it will be available in Kindle, Nook, Apple and other ebook stores. It will also be available in paperback here. The beautiful illustrations have been created by Julie Freel with pastels in a style that is very emotive and close to the hearts of children. We both hope the books will bring joy and confidence to many, many children. To get your free ebook, choose from among the books under the Books by the Fire tab. Then send me an email via the contact page and let me know which book you choose, your favorite ebook format (kindle, pdf or epub for tablets and ipads) and your email address.